When one understands that elephants, like humans, form close family groups, it makes a visit to the Elephant Orphanage Project at Lilayi a heart wrenching yet at the same time heart warming experience. Run by Game Rangers International, the Elephant Orphanage Project had five orphans in their care when we visited them in April. Whilst the exact circumstances of how they became orphaned is not always known, it is believed that most are as a result of poaching or some other human conflict. In the first two years, young elephants are extremely vulnerable and highly dependant upon their mothers for the nutrient rich milk without which they will not survive. But it is not only the milk which they need. It is also the care which is given to them by their mothers and the rest of the herd which sees them through infancy and on their way to adolescence and eventually adulthood. 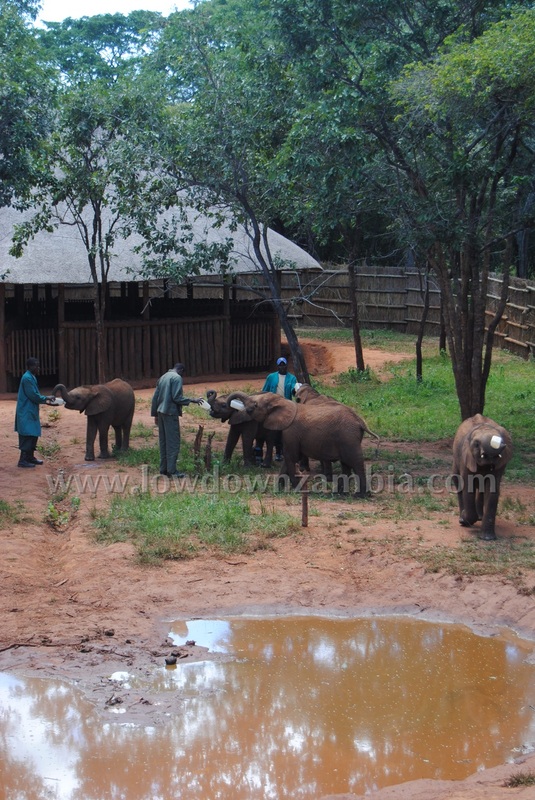 At the EOP, the keepers together with the other orphans take the place of their mothers and the rest of the herd. Whilst still dependent on milk, feeding time takes place every three hours, throughout the day and night. But not only are their keepers with them at feeding times, they are with them round the clock whether the orphans are out in the bush on a walk or at night when they are in their stables sleeping. The constant presence and the interaction with their new siblings and with the keepers help them to overcome the loss of their family. The orphans at Lilayi will remain there until they have been weaned off milk, at which time they will be translocated to the Orphanage facility in KafueNational Park. By this time, they are far more independent, needing less human support, and seem to integrate well with the older orphans. 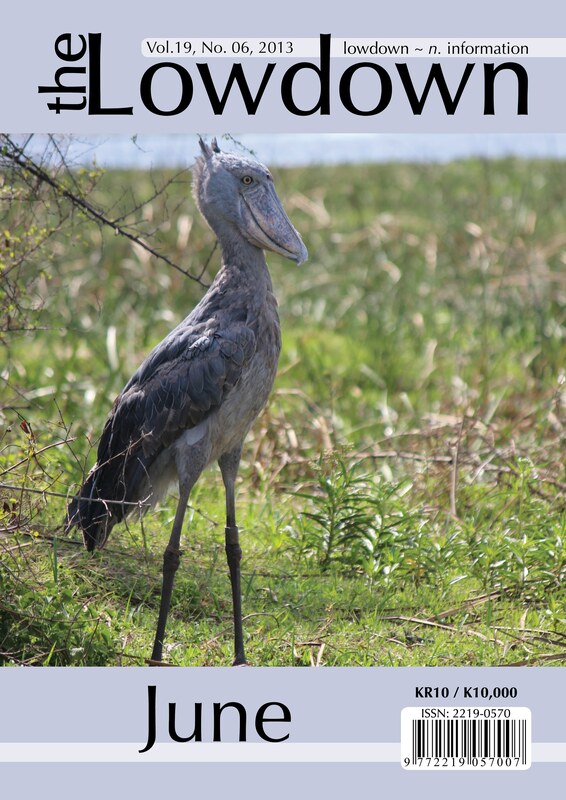 Their days in Kafue are spent browsing in the bush and with wild herds of elephants in the area, there is a good chance that they will integrate into one of these herds. The orphanage facility at Lilayi now has a double story viewing deck for the visitors to watch the orphans. Feeding time is 11:45 am and it is clear that the orphans know what time it is. Coming back from a bush walk, they run straight to where the bottles are. The older ones, once given their bottles, are able to hold their bottles on their own whilst the milk disappears rapidly. 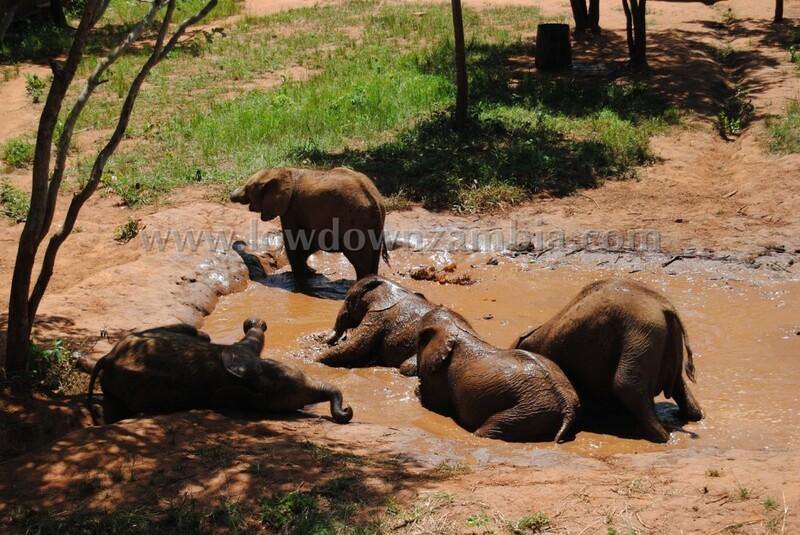 After feeding, it is time for play in and around the mud bath. If one has had the opportunity to observe elephants at play in the wild, and one now sees these orphans, playing, they look happy and well-adjusted, up to the antics that one would expect. 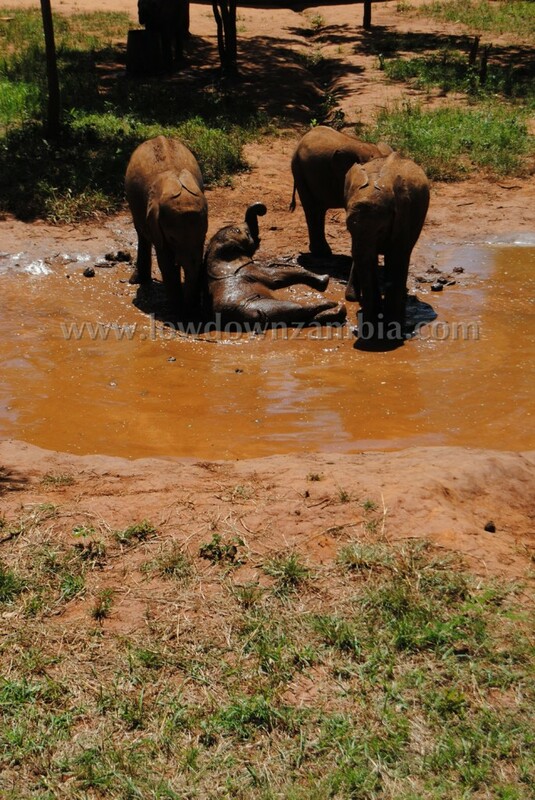 The younger ones flop around in the mud bath where they really get down and get dirty whilst the older ones act in a more mature manner. It really is quite fantastic to watch them especially when one thinks of the tragic start to their lives. During visiting hours, one of the volunteers who works at the EOP is on hand to tell you about the background to each of the orphans as well as the background to the project and the orphanage facility. We were certainly mesmerized during the hour that we spent there. Visiting hours are from 11:30 am to 1 pm and they are open everyday. The EOP is located at Lilayi Lodge. To get there, turn down the Lilayi Road, south of Lusaka, proceed to the T-junction, turn right and take the dirt road left after the PoliceTraining School. Turn Left into the Lilayi Lodge gate. There is currently no entrance fee although there are plans to introduce a fee. In the meantime, donations to this very worthy cause are welcome. Musolole was less than 6 months old when he was found by ZAWA Officers in Sioma Ngwesi after poachers had shot his mother. He was weak, severely dehydrated and covered in sores as his body had struggled to cope without the essential milk from his mother for at least a week. His skin was so thin that he bled after scratching and one of his toe nails had even fallen off! He was transferred to Lusaka by road, which took 16 hours! He was mildly sedated and under the close supervision of Dr Squarre, ZAWA Vet. At the Elephant Nursery Musolole has since recovered from his traumas and weakened condition very well and is an incredibly sociable and playful young elephant. Management staff at Maramba River Lodge had noticed a small elephant wandering along the banks of the MarambaRiver for a few days. By day 7 it was apparent that the calf had been isolated from his herd and was starting to lose condition. With tremendous support from ZAWA Livingstone, ZAWA Vet Dr Kamboyi and other volunteers, the young elephant ‘Maramba’ was captured and the EOP team safely transported the young bull to Lusaka. Maramba was approximately 18 months old and although capable of eating vegetation well he still needed the nourishment of his mothers milk to survive, this was evident through his poor condition and the stress sores in and around his mouth. Although he was very feisty to capture, Maramba calmed into a very gentle young elephant who seems incredibly grateful for his milk bottle! Kavala’s mother was shot by poachers in 2011. 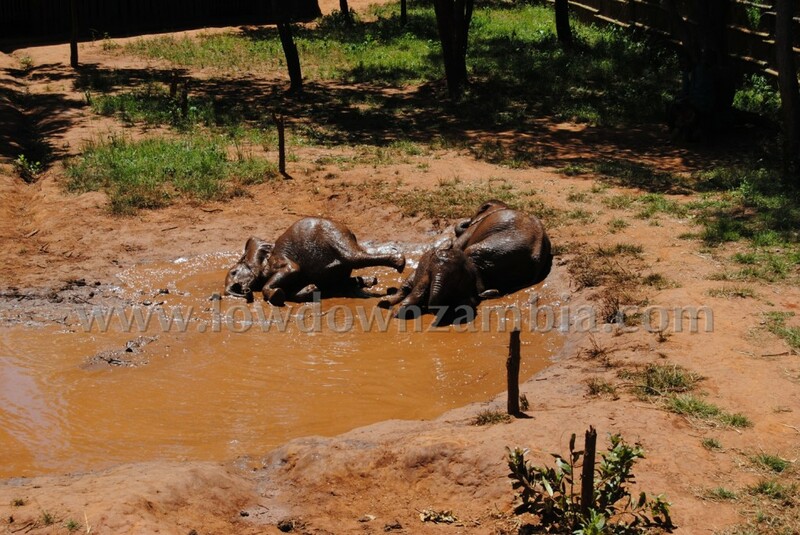 Her body was found by the Zambian Wildlife Authority with tiny baby droppings surrounding her, but no calf. Three weeks later a weak and emaciated elephant orphan was spotted in the area on the banks of the ZambeziRiver in Rufunsa GMA. At approximately 10 months old, Kavala was in desperate need of milk formula but had managed to survive on vegetation throughout that time. She had an abscess on her knee and many infected sores all over her body due to her malnourished and immune suppressed condition. With the right diet and combination of treatments and care Kavala healed rapidly and is now a confident and boisterous youngster. Management staff at Baines River Camp had a huge surprise when they saw that the guest who was splashing about in their swimming pool was actually a one month old baby elephant! Poor little Bezi (as he is affectionately known) had fallen into the pool as he was desperately trying to drink water. He was skinny and very dehydrated and at such a young and vulnerable age, he had not developed the muscles and coordination to drink with his trunk. As he got down on his knees to stick his head into the water he must have toppled in! There was no sign of his mother and his condition suggested he had been alone for at least a few days. He was taken to the headquarters of Conservation Lower Zambezi to be stabilized. But due to an outbreak of anthrax in the area he was quarantined there for two months before being moved to the orphanage. EOP staff supervised and trained additional local staff to ensure that Zambezi was cared for at the highest level and given the attention he desperately needed since he was not able to be with other elephants during his quarantine. 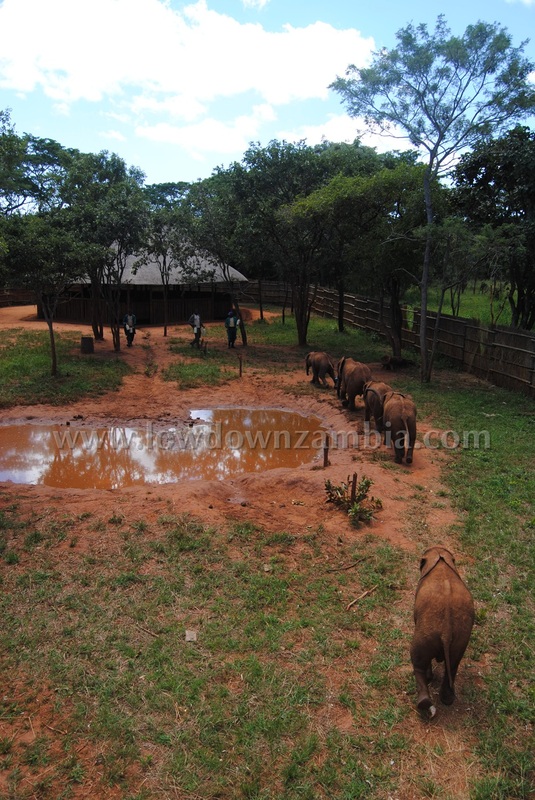 In January 2012 Bezi was flown to Lusaka, courtesy of Royal Air Charters, to join the other orphans at the Elephant Nursery where, after a slow start, he has really flourished. In April 2012 Suni was found by staff of Sun International dragging herself along the road. At 8 months old she had become orphaned and whilst alone and vulnerable was subsequently attacked by somebody! She sustained a horrific axe wound to her spine and was paralysed in the back right leg! Despite this huge trauma Suni instantly responded to the care provided by Keepers and drank milk with a very hearty appetite – this gave us hope that she was not suffering pain, but was more suffering from a loss of feeling and nerve trauma. After a month of intensive nursing and veterinary support by the ZAWA vets, Suni was able to use her leg again. She has subsequently been fitted with an Elephant Boot by ‘the Boot Makers’, Dan and Mark, who have flown to Zambia TWICE (courtesy of Nigel Goodman) from Norway and the US to create this boot which ensures that her leg remains supported at all times!